A great display of green Aurora [Aurora] dances in the evening sky overhead as an intense summer Thunderstorm pounds the earth below. These completely unrelated events are captured in this handheld photograph while airborne at 35,000 feet looking northward from over the "Lake of the Woods" on the Minnesota USA / Manitoba / Ontario CANADA border (N49, W095) [map] . Lightning [Lightning] that is inside the cloud cannot be seen directly but illuminates the entire cloud as a glowing flicker of bright light. This evening's numerous Thunderstorms [Thundercloud] in northern Minnesota were extremely intense, creating a spectacular view which was further supplemented by the occasional Perseid meteor (not pictured). Apparently the storms caused some local damage as detailed in these newscasts: [link-1], [link-2]. The Aurora is often present but usually less impressive. It usually occurs in areas of the world where most of us simply don't live. 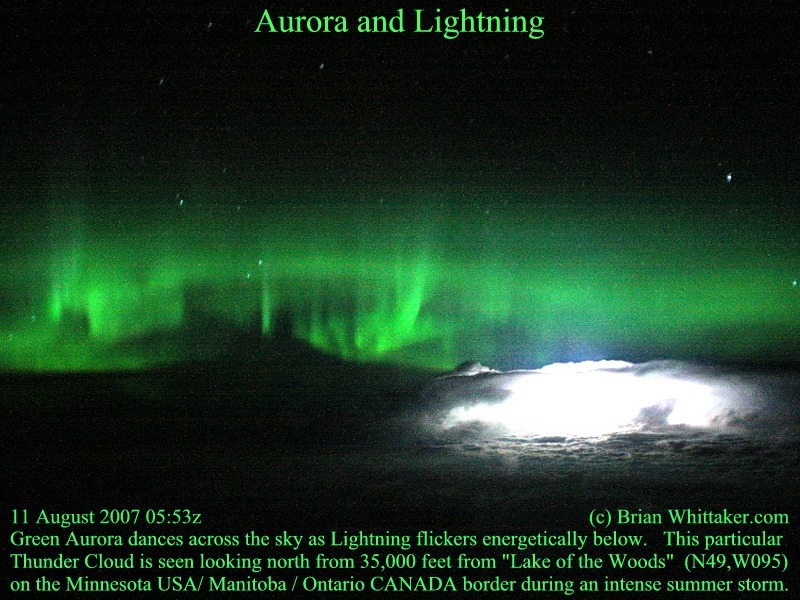 A giant global oval of Aurora activity circles the north and south magnetic poles. Would you like to know the current location of the Aurora Ovals? [Oval-map]. Try looking at SpaceWeather.com for daily related features [link]. Canon EOS D400 (XTi). 11 August 2007, 0553z. [800x600].